‘TAKE A LOOK AROUND’, the SELL-OUT SOUL FOUNDATION ARE BACK, ready to party ‘ALL NIGHT LONG’. After a sell out Hogmanay event to see in 2015, Summerhall is Reaching Out, and Will Be There for another retro, glitter filled night seeing in 2016. You did not Hear It On The Grapevine. 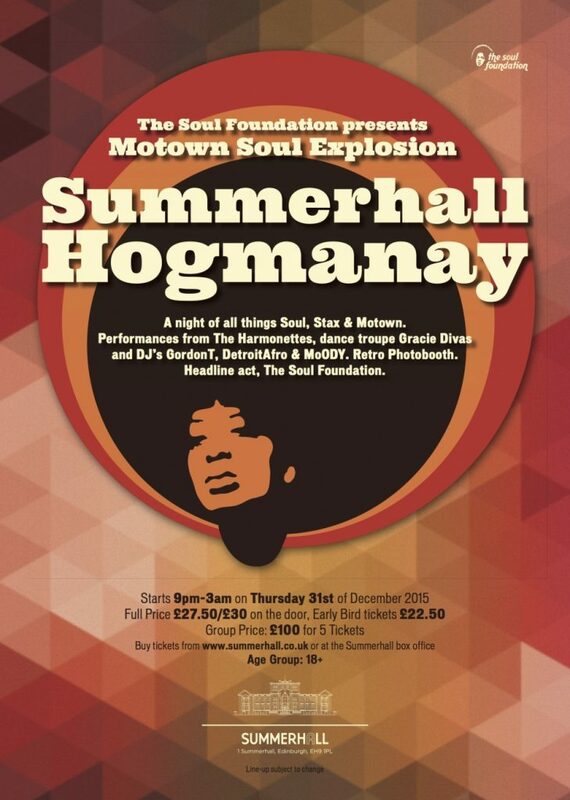 Summerhall Hogmanay will be a night to remember, jam-packed full of all things Soul, Stax & Motown, with a sprinkling of Disco thrown in for good measure. In Summerhall Hogmanay: Motown Soul Explosion – there will be performances from ‘The Harmonettes’, a female vocal group. Get in early! Dance troupe ‘Gracie Divas’ will present a funky, disco dance mash-up. Make It Night To Remember capturing snap-shots of your evening with our free Retro Photobooth. On top of that our soul & disco DJ’s GordonT, DetroitAfro & MoODY, will be spinning a mixture of Motown, Soul, Disco, Stax & Northern Soul. The finale for the evening and taking us through the bells countdown and in to 2016 will be our incredible headline act: The Soul Foundation LIVE!